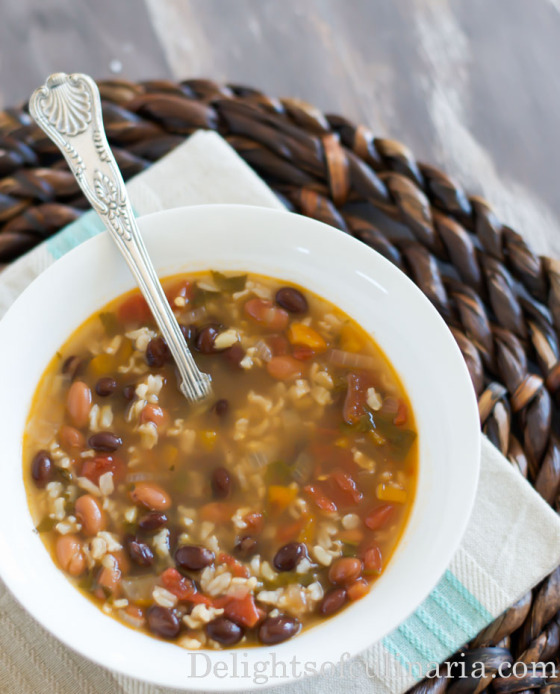 This is a healthy,hearty, and delicious bean and rice soup. It’s totally satisfying and perfect on cold winter days or nights. 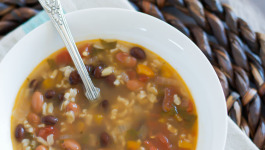 You can make it pure vegetarian by adding just water or vegetable broth, or for more flavor you can use chicken broth. *Cook rice until half way done. Heat oil in a pot.Throw in onions and bell pepper.Saute until soft. Add diced tomatoes with chilies,onion powder,cumin powder,salt,pepper,chili pepper,smoked paprika,bay leaf. Continue to cook stirring occasionally. Throw in beans and rice.Cover with water or broth. Bring to boil,throw in cilantro. Reduce heat and let it simmer for 15-20 minutes. Can be served with sour cream and/or a squeeze of lime juice. 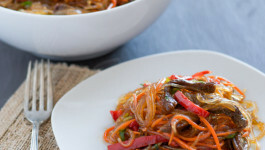 Funchoza salad with beef is very well known Korean noodle salad dish. 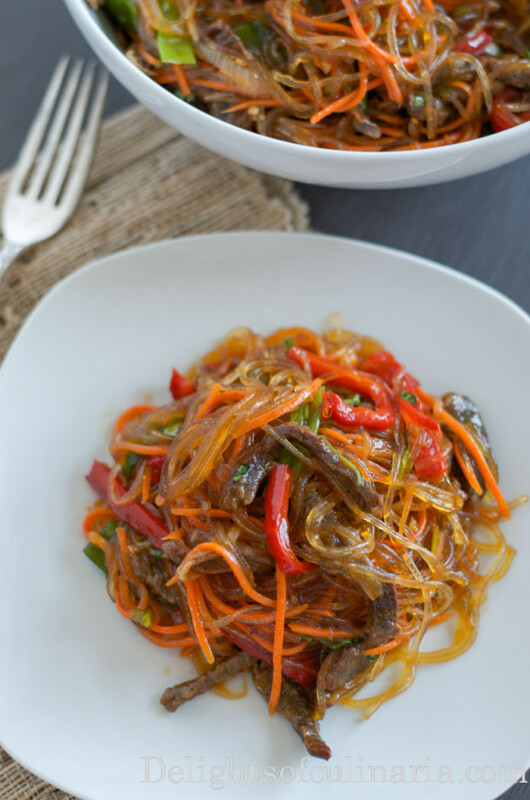 Flavorful combination of sautéed veggies, browned meat, and glass noodles (bean thread noodles) dressed with sweet chili and soy sauce. It’s so delicious and can be made few days ahead. You can omit meat for vegetarian salad or sub in chicken.If you don’t like sweet type salads,you can omit sweet chili sauce. On medium high heat,In a frying pan or dutch oven heat about 4 tablespoons oil. Throw in strips of beef and season with salt. Cook with lid closed stirring occasionally until meat is slightly browned and soft. Remove meat to a large colander with a bowl or plate underneath. Throw in onions and sauté until softened.Transfer to the colander with meat. Repeat the procedure with carrots,bell peppers, and daikon with green onions.Adding more oil as needed. Cook bean thread Following instruction on the package(don’t overcook). Cut noodles if desired with knife or kitchen shears. 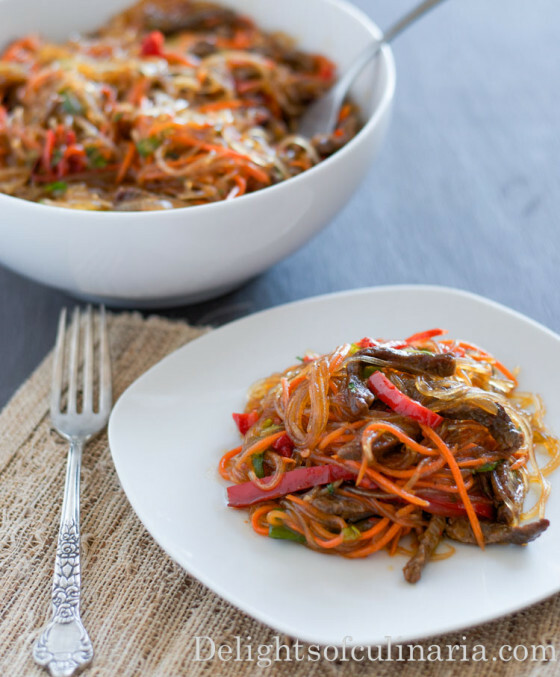 Transfer all cooked ingredients to a bowl, then add garlic, cilantro, soy sauce, vinegar , and sweet chili sauce. Mix it well and refrigerate for at least 2 -3 hours. Throw in strips of beef. Cook with lid closed stirring occasionally until meat is slightly browned and soft. Cook bean thread Following instruction on the package(don't overcook). Cut noodles if desired with knife or kitchen shears. 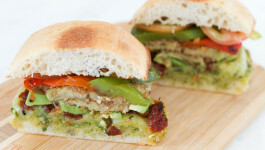 This is a gourmet toasted vegetarian eggplant sandwich with pesto,sundried tomatoes, broiled bell peppers and cheese. These sandwiches are perfect for any time of the day and are good to pack for lunch or enjoy at a picnic on a beautiful warm sunny day. 4-6 slices of cheese like Havarti,fresh mozzarella,provolone,monterey jack. Season Eggplants with salt on both sides and arrange on a baking sheet or large tray.Let them sit for 10-15 minutes. Heat oven to broil.Cut sides of the bell peppers to equal four pieces.Broil peppers until the skin is charred.Remove charred skin. In a bowl whip eggs with whisk or fork. Heat a skillet or a frying pan on medium heat.Add about 1/4 cup of oil.Dip each eggplant round in egg, then in panko crumbs.Fry both sides and transfer on a plate lined with paper towel. Spread pesto sauce on one side of the bread.Add a little amount of sundried tomatoes (if desired).Place 1 slice of cheese and 1-2 tomato slices (if not using sundried) on each sandwich half. 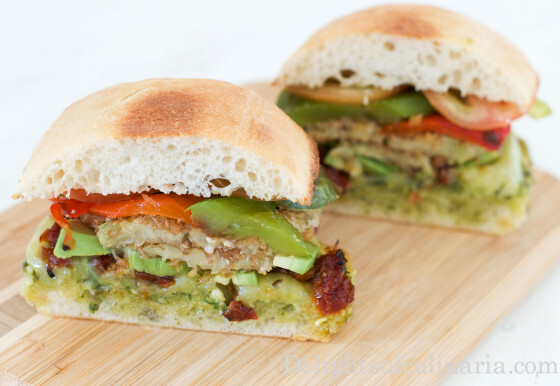 Arrange sandwiches (top and bottom piece) on a baking sheet. Toast the bread until cheese is melted. Place avocados on top of the cheese followed by eggplants,and bell peppers. 4-6 slices of cheese Havarti,fresh mozzarella,provolone,monterey jack. 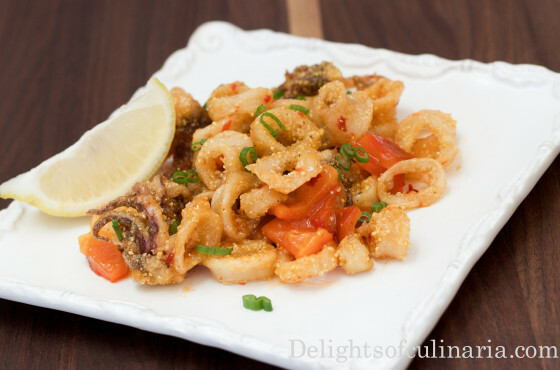 This is a copy cat recipe from Ruth’s Chris steakhouse restaurant.We love it so much that I decided to recreate this appetizer dish.Their fried calamari with sweet chili sauce are AMAZING and addicting! They are dredged in seasoned flour coating, fried until browned and crispy, then tossed with sweet chili sauce and diced roasted red peppers. * I bought the sauce at Trader Joe’s,or you can make your own by this recipe. Heat oven to 500 degrees on broil. Place bell pepper on a baking sheet. Broil until charred,turning sides 3 times. 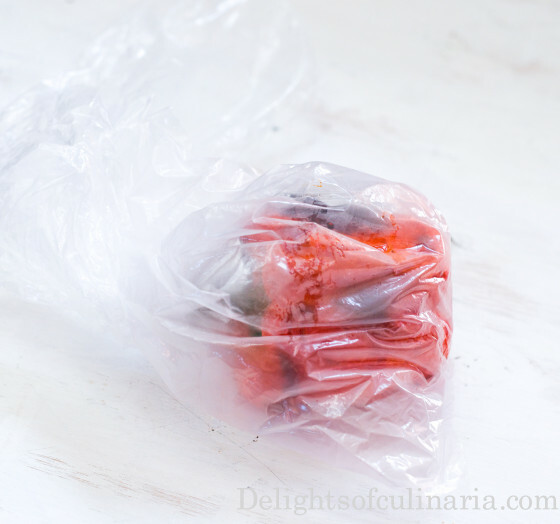 Remove from oven and place it inside the plastic bag or ziplock bag. Set aside and let them cool enough to handle. When peppers are ready to handle,peel off the skin. Cut peppers in to 1/2 inch squares.Set a side. Heat oil over medium-high heat to 350 degrees. In a bowl,combine flour,old bay seasoning, and black pepper. In small handfuls,dredge the squid in the flour mixture and shake off excess. Gently lower the squid in hot oil. Fry in batches for about 3 minutes or until lightly golden in color. Remove from oil and sprinkle salt. 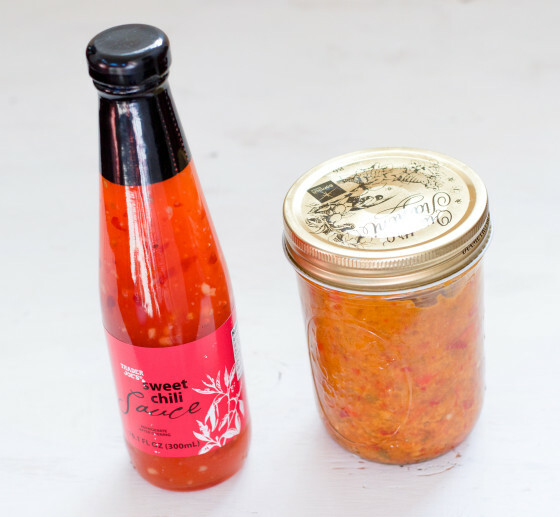 In a small sauce pan, heat sweet chili sauce with squeezed lemon juice. 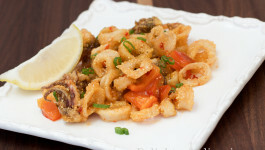 Toss Calamari with sauce and roasted bell peppers. Transfer to a serving platter and sprinkle with minced parsley and/or chives/green onions. Squeeze more lemon on top if desired. * I bought the sauce at Trader Joe's,or you can make your own by this recipe. Cabbage is very popular vegetable in Russian cuisine.We make salads,we make soups,we make golupsi,piroshki,and braised cabbage.Cabbage is very nutritious and delicious! 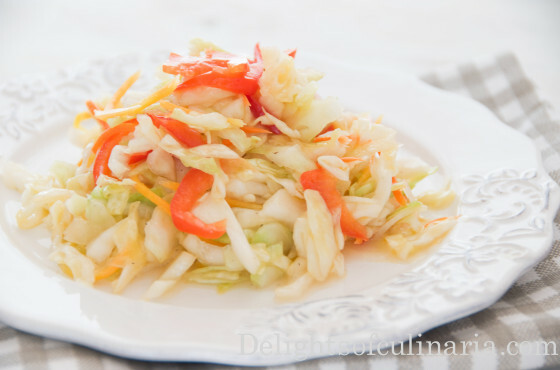 I prepare variety of cabbage salads often,because my whole family loves this vegetable.This salad crunchy,a little tangy with little sweetness from carrots and bell peppers. In a large mixing bowl,shred cabbage using a mandolin slicer. Add sugar and salt to cabbage.Massage cabbage for a little. 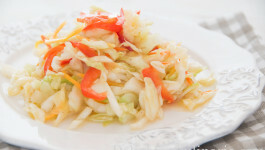 Peel carrots and julienne thinly or grate them on top of cabbage. Cut bell pepper in four equal parts.Slice bell pepper over carrots using a mandolin. Peel onion.Cut onion in four equal quarters and slice thinly over bell peppers using mandolin slicer. In a skillet or frying pan,heat oil with 1 small onion or 1/2 onion cut vertically(whole tail on) and chili pepper.Oil needs to get really hot (bottom of an onion should be really dark(black). Meanwhile,pour vinegar over cabbage ,carrots,bell pepper ,and onion. When the oil is ready and really hot,Pour it over the salad on the onions. Mix until all the ingredients well combined. This salad can be served right away or for best results next day.Can be stored in a glass jar for a week or so.